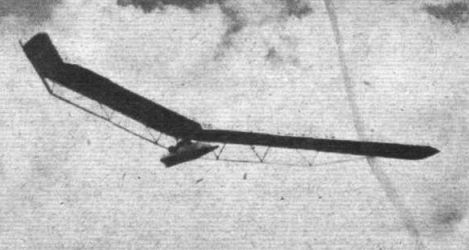 The Rhon Soaring Competition: View of the "Weltensegler" (world-soarer) in flight. A few minutes after this photograph was taken the machine did a righthand turn, got into a nose-dive, and crashed, the pilot (Willy Leusch) dying from his injuries later. The Rhon Soaring Competition: The series machine of the Segelflugzeug Werke Baden-Baden. Note the unusual arrangement of the wing-tips.